Twin Village Music was started in 1954 by Rudolph Tichy Jr. & his wife Dolores. Although very few people are aware of what the term Twin Village means today, at the time everyone in the area knew that the name referred to the “Twin Villages" of Lancaster & Depew. Rudy & Dee met at the “The Old Barn" Nighclub in East Aurora where Rudy played in the dance band and Dee was a waitress. Rudy had served in the Army in Europe during World War II and kept busy after the war with a variety of jobs including teaching music lessons in the Clarence Central School District during the day and playing at The Barn weekends. After some discussion on the subject of opening a music store they rented a space at 34 West Main St and registered the name Twin Village Music Studio in the summer of 1954. They got married before the year was over and Rudy III came along in 1955. In 1957 they purchased a building at 19 West Main St and built a house in the rear attached to the new store. 19 West Main St was home to family and business until 1970. In 1970 Urban Renewal made a move necessary and the business was moved to 44 Central Ave where it remains today. Guitars, Amps, Drum Sets and thousands of school band and orchestra instruments are still major parts of our business. In 1954 however accordions were the big thing. 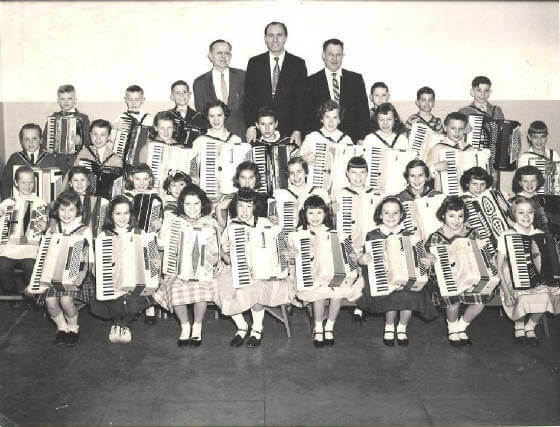 Almost every home in Lancaster & Depew had a future member of a polka band taking lessons at Twin Village Music. Here we have a picture of one of our accordion bands. Yes, arrangements written out for 1st, 2nd, 3rd and bass accordion parts. Pictured are teachers Ralph Applin, Jerry Battistoni with store owner Rudy Tichy. If you see yourself in this picture send us a message at mail@twinvillagemusic.net ! Rudy Tichy with his band playing at The Barn in East Aurora. 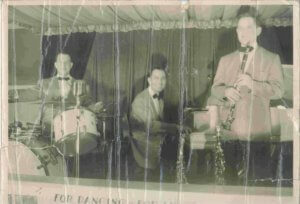 The sign in front of the group can barely be seen reads: “For Dancing – For Listening – Rudy Tichy and the Melody Nights" Jerry Battisoni on piano and Don Baker on Sax & Clarinet. 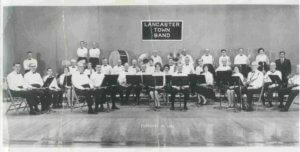 Below: Lancaster High School Band Director Clarence Kemp gathers “Past, Present & Future Bands". All students that played in the school bands grades 4 to 12 plus alumnae!